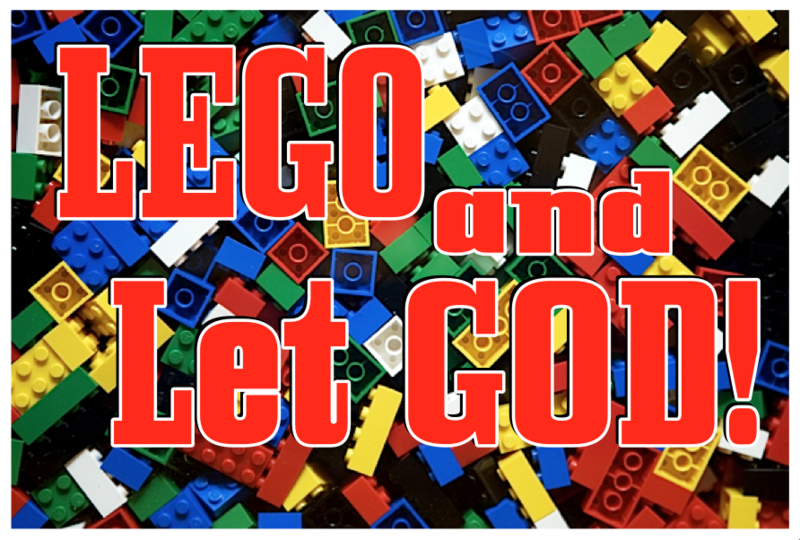 Home Children's Ministry LEGO and Let God! I wanted to take you behind the curtain a bit, and share a little about how I create complete curriculum units in a short amount of time—as I’m often asked for “my secret” or for help when friends find they need to crank out an entire series in a short amount of time! I’ve done a Kid’s Church unit in the past where we looked at our “Connections” to God, Family, Church, Friends, Neighbors and the World. But I had 8 chapels to write and that series was only 6 lessons—and while I could do an intro and a review—the creative in me said, “Time to do something new and fresh!” rather than rehash something old. I did look through them for “lego ideas” that would be transferable. And there I had my 8 chapels—eight things we need to BUILD into our lives! FAITH – GOODNESS – KNOWLEDGE – SELF-CONTROL – PATIENCE – SERVICE – KINDNESS – and LOVE. These are the things we need in order to succeed as we Build our lives after the design that God has for us. I’m often asked by folks how I crank out an entire series quickly—and I enjoy sharing a little secret as I know many of us in children’s ministry leadership find ourselves writing curriculum—if not for our regular programs—for special things that come up. Writing eight lessons one at a time would honestly take days, as there would be constant editing and moving things around back and forth between lessons as you progressed. I used to find myself getting an idea and realizing it fit better in a previous lesson, and then I had to edit that one, and figure out what to do with the idea that was there that I was removing. It ate up a lot of time and made managing the content of the lessons difficult. I developed a technique while writing DiscipleTown that speeds up the process quite a bit. I make a chart with the lessons across the top and the lesson elements down the side, and I don’t write by lesson, I write by element. Another way to say it, is I write horizontal instead of vertical. In other words, instead of completely writing lesson one before starting lesson two, I go across the page filling in the “Teaching Game” column and create a game for each lesson that fits the topic for that day. (Faith, Goodness, Knowledge, Self-Control, Patience, Godliness/Service, Kindness, and Love) Of course, I invented games with Legos! Keeping my mind and focus on only games is more efficient than shifting gears constantly from fun games, to dramas, to the more serious lesson, to other elements. Then, as an example, since I use a puppet to introduce my lessons, I’ll write his intro across all lessons. 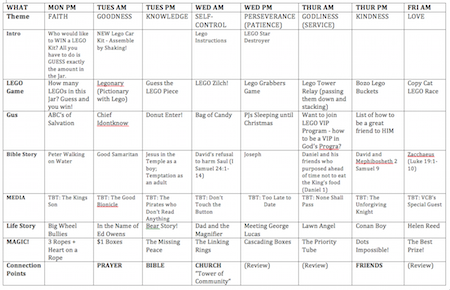 Since I like to do a magic trick during each chapel at camp, I took my list of magic tricks, and looked for ones that fit each topic and entered that on the chart. 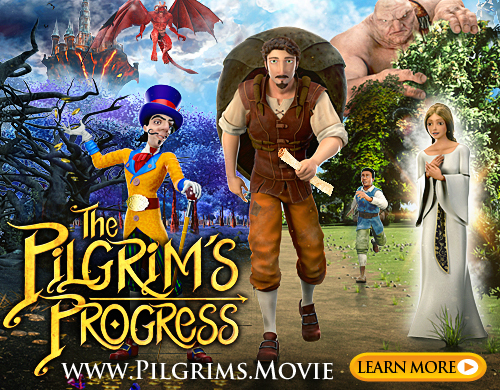 For Bible Story, I prayed about what Bible Story best illustrates the topic of the lesson. (Google helped too, shhhhh!) Since I have some Toybox Tales created with Legos, I ened up choosing a Toybox Tale video for each lesson. At camp, I always use a Real Life Story, so I thought about what life story or experience fit the lesson. You can do the same with Object Lessons or whatever teaching elements you use. And so on, until all the lesson elements are filled in. You may find you add or remove lesson elements as you go, as you decide what is needed. Within hours (instead of days) your lessons are all done! Then, you merely weave the elements together to teach and it takes about an hour of prep to finalize each lesson before teaching, but I can do that at camp when I can be focused on just the lesson I’m about to teach and leave the rest for when their time comes. The important thing for now, is that I’m sure I’ll have all the props and gadgets I need for the lessons since the games, visuals, objects, props, etc. are all planned. Now, a master of curriculum writing you will be! Use the Holy Spirit you must! Plan ahead you must! Be strategic you must so that powwwwwerful lessons you may teach! Heh, heh, heh. I loved this so much, I hope you don’t mind but since we are using a Lego theme for camp we also wanted to use these verses. They are excellent all together! 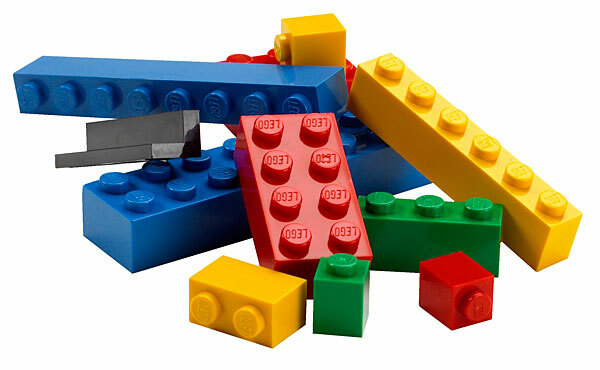 So I have a question….we are considering a “lego” theme for our Kids Kamp this summer and I’ve been trying to find out if it’s ok to use that actual word “Lego”? I see you did, and others have as well. Is there any kind of special permission you have to get from Lego to use their name? I’m not a lawyer, this isn’t legal advice – but from my experience, the issue is publishing and appearing to claim any rights or originality yourself. Using the trademarked name in something you publish to sell puts you at risk – how much? Ask a lawyer. 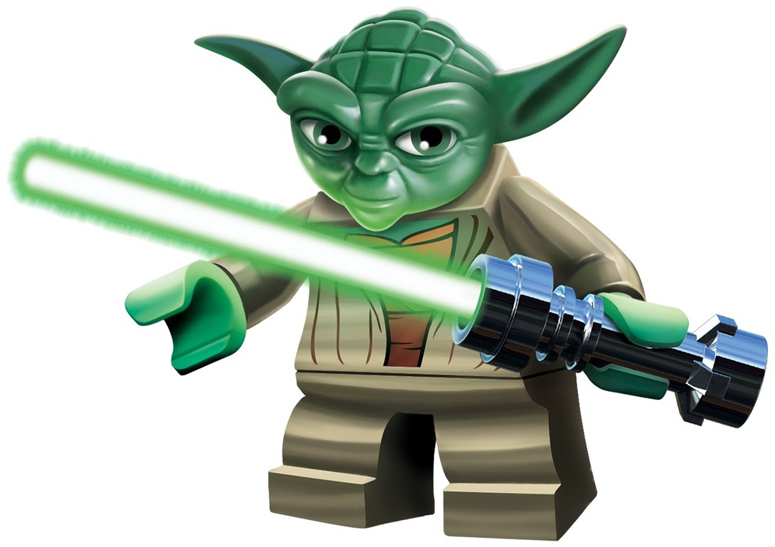 But since you’ll be buying Lego, promoting Lego and encouraging kids to use/buy/collect Lego – manufacturers generally appreciate the free marketing. 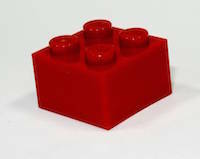 Many have used Lego (or Minecraft or other trademarks) as a theme, and I’ve never heard of it being an issue or getting anyone in trouble. Is the Lego VBS materials still available? Creatively Reaching Kids, with Spinners! A Quiet But Wonderful Thanksgiving!